Report: Ford GT Competing In IMSA This Year? Will we see the Ford GT competing In IMSA this year? Maayyyybee. Ford blew the automotive world away earlier today with the reveal of the drop-dead-gorgeous 2017 GT, which is slated to be a limited-production model that will be delivered to the (small-in-number and large-in-luck) masses sometime next year. 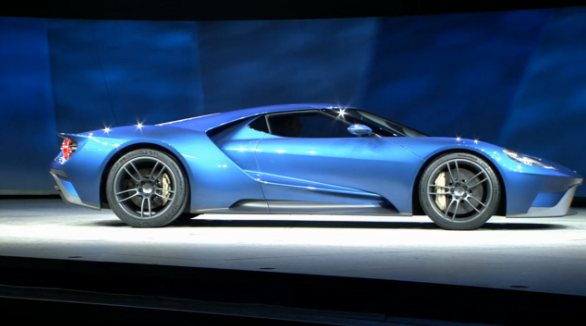 This leaves the question as to what plans entail for the future of the Ford GT as an on-track competitor. Rumors have persisted that it will participate in IMSA in the Tudor Sports Car Championship in 2016 to commemorate the 50th anniversary of Ford’s first Le Mans win, but a report indicates we could be seeing it a lot sooner than that. How much sooner? This year. According to Jalopnik’s Travis Okulski, who spoke with “someone familiar with the matter,” Ford has already tested the preliminary work necessary to enter the Ford GT into IMSA this year. IMSA President Scott Atherton was paying plenty of attention to Ford’s presser this morning, calling the GT “stunning” and “spectacular” while completely declining comment as to whether it would appear in Tudor Sports Car Championship in 2015. He did, however, say that he would give up more than a pound of flesh to get one. The 3.5-liter twin-turbo EcoBoost V6 would be in compliance with IMSA’s regulations, and, perhaps most importantly, with the regulations of World Endurance Championship. This, naturally, means it would be on track to make its long-awaited and speculated return to the 24 Hours of Le Mans.